Okay I'm seriously going to try to blog more often I know I have said this before but really I'm on it this time. I have been getting a lot of pillow requests from my family and friends and seriously pillow inserts are an arm and a leg, I have been basically been buying muslin and poly fil and making my own pillow insert. I did the math and they are super cheaper than buying the already made ones. The cheapest ones I have found (16x16 insert) go for about 8 bucks. If I did the math right the cost of the muslin and poly fil run me about 2 bucks to make. Of course there is a trade off it takes me about 30-60 minutes from start to finish pillow insert to make it. Depending on how you value your time maybe it's not for everyone, but I have a good amount of free time still, well enough to still put effort into making pillow inserts. 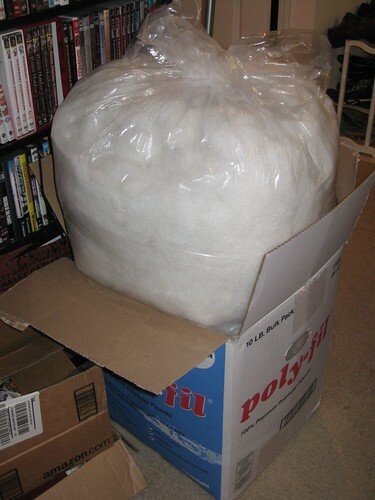 Before Christmas I seriously thought I was going to be in pillow insert making mode and bought this 10 lb box because that was the best deal, except I bought a ton of 16 oz bags at Joannes when they had that awesome after thanksgiving sale. So after Christmas I kept bumping into the box and I sort of wondered what was in the box... see I thought there might be 10 - 16 oz bags stuffed in there... so what do I do? I opened it. Let me tell you it's just one big bag and it expands fast! Within minutes it expanded about 3 inches above to top of the box. I couldn't close the box up again. Oh well. I didn't think much of it. Here it is at 3 days later. Scary! It's almost twice the box size now. I am glad to hear that making pillows is cheaper than buying them. The cost of a pillow inserts is what has kept me from making them.